I suspect this will not be a very popular post but I think it is time for me to put in writing a trend I noticed in Singapore and even Asia – ticketed worship concerts where people buy tickets (with top priced tickets as much as over $100) to be in concert of international worship bands. I guess many will say what is wrong with paying for the tickets as there is cost in putting up something of this scale. I do understand there is cost, perhaps better than a regular consumer as I was a show promoter (event organiser who specialises in putting up concerts) of commercial music shows in Asia Pacific and I definitely understand the amount of financial investment involved in putting up a big show. I have never ventured into ticketing worship concerts even though I have been in worship ministry since I was 17 years old, not including years served in youth ministry as musician and worship leader. I could have “married” the commercial show promoter job with worship and put up worship concerts simply based on the skill sets I have. In an attitude of prayer and submission to the Holy Spirit, I present to you my conviction after years of struggle in prayer and studying of the Word. I will start from the basis that worship is not music, although music can be an expression of worship. I am not doing a word play here. Mark 7:6-7 quoted the Old Testament. As you can see from this scripture passage, clearly worship has been offered through their mouth, which can be prayer or songs, but it is not acceptable worship to God. It is the heart that God is after, not the outward appearance or audible sound. Biblical worship is a heart attitude and not a genre of music. Not just in Christianity, but humanity understands worship as offering something of value to please a supreme being to gain favour. The New Testament in Romans 12:1 gives an imagery of believers coming before God and presenting ourselves as sacrifices before God. 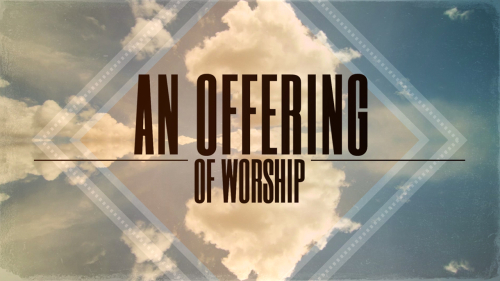 The world’s understanding of worship is to offer God something to get something in return. Biblically it is the opposite. We offer God ourselves in worship because God first reached out to us and blessed us. Romans 11:33-36 gives the reason why Paul wrote 12:1. Biblical worship is a response to God when we catch a glimpse of His greatness and know in the depths of our hearts that He is worthy. Worship is sacred. Sacred not as in religious sacred that is bound by religiosity but sacred as in one that is set apart and precious. Our accessibility to enter God’s presence to worship cost Jesus everything by becoming the sacrifice. The price to worship is fully paid in Christ. The value and significance of worship founded in this act is more than sufficient to consider worship sacred. If someone gives you a gift that saved your life while costing his own, you will consider that gift sacred, of a completely different standing from your other gifts and things. This gift in your heart is set apart, precious and cannot be compared with anything else. Same for the work of Christ on the cross. Worship is something that money cannot buy as someone has paid the price that I can never afford. So how does ticketed worship concerts align with Biblical worship? I can see two major areas that provided sufficient conviction for me to not thread into this. Ticketing worship is sale of worship. I understand that some Christian events, a nominal ticket fee is charged for commitment to attend to ease logistics and operations planning and is affordable to most, if not all. Here I am referring to ticket prices similar to a normal commercial concert ticket price, which then implies the decision of price is for profit as a commercial concert would. For ticket holders who paid commercial rates, it is no difference to a sale transaction as compared to a commercial concert. With the commercialisation of attending worship concerts, a mindset of consumerism is encouraged. Since I pay for it, I should get pleasure out of it. This heart attitude completely contradicts Biblical worship of coming to give to God rather than to receive. Of course there are individuals who attend worship concerts who genuinely wants to worship God and their heart attitude are to give to God. I am referring to a system that encourages and promotes a mindset of consumerism worship (if there is such a phrase as it is a complete oxymoron). Perhaps right now we do not see the effects, but 5-10 years down the road, Biblical worship will be further from the next generation than ever. This part is directed to events organizers and spiritual leaders who are doing or want to do worship concerts. I completely understand and empathise the enormous financial investment in putting an event together similar to commercial shows where there is tremendous stress throughout the promotion until box office announces “sold out”. Even then, cost management is a huge priority. Biblically we teach people to tithe and give offering. Nowadays I hear worship concert organisers say that we need to educate people to pay for the worship concerts for you do not muzzle the ox that works for you. I truly believe that the sound and lights guys, and all the staff who are professionally putting in their time, effort and skills need to be paid. Yet worship is based on sacrifice and not a charge. Here we have a dilemma. This is where the Kingdom of God works differently from the system of the world! When the Lord graces His manifested presence to touch and minister to His people in a worship gathering, He will move the hearts of people to give sufficiently, and even more than expected, than what is needed to put the event together. This is the part where faith comes in and only through faith do we please God. The heart of David is such that he will not offer God anything that cost him nothing. As event organizers and spiritual leaders, may I challenge you that in your heart’s desire to bring the body of Christ together in worship, be the first to put that worship offering in front of the altar of God by trusting in His provision to pay for the sacrifice of worship that he has put in your heart, knowing that Jesus did it already? With this posture, the decision to do an event will be based on seeking God for His will and not based on popularity or financial viability. A ticketed worship blurs the focus. My first question is who is the focus here, God or the worship band? The worship band may not have the intention of being worshipped and have their eyes on God, but the system has put the worship band right in the forefront to attract people to come for the event. The motivation to gather is not Jesus Christ, but the band. I believe the motivation says a lot about who is the focus of worship in a situation as such. I heard testimonies of salvations from the concerts, and people have been more opened to Christianity. This openness is to the Christianity that was presented on stage in the glitz and blitz, but when they find out about the hard teachings of Jesus, will they still be open? Same for the salvations. It is no difference from a misrepresentation of the Gospel’s call to the Great Commandment and the Great Commission. I, on the other hand, believe that God can turn their hearts around to genuine conversions as He is God who can turn everything and anything around. I rejoice in these salvations and God encounters during these events. Once again, hear my heart, I am pointing to a system that in itself distracts people’s attention from God and by no means downplaying what God can do. I am going to reiterate that I do not discount the testimonies from worship concerts and I praise God for touching the lives of people. I am referring to a system that is counter Biblical worship and subconsciously instilling values and mindset that are not aligned to God’s. We may not see the effects now but we will see it in the next generation which might take a generation or more to be realigned. Writing this on my blog is also a constant reminder to myself that I will keep worship sacred in my life and pray that this will be a checker lest I slip or deviate.